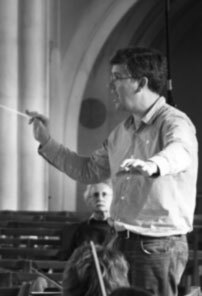 Christopher Cox has been conducting for thirty years since his debut with the University College London Symphony Orchestra as a first year history student. Following successful performances of symphonies by Shostakovich and Bruckner at UCL, he was invited to conduct the newly-formed Bloomsbury Chamber Orchestra, and went on to conduct that orchestra for five years, including regular concerts in London, as well as at Norwich Cathedral, Oxford and Cambridge. In March 1995 he conducted the BCO in a performance of Schumann’s ‘Concertstück’ for four horns and orchestra with Tim Brown and the horn section of the BBC Symphony Orchestra. In 1995 and 1996 he conducted the Bloomsbury Philharmonic Orchestra in Mahler’s fifth and sixth symphonies before work took him away from London. In 1999 he was invited to conduct a scratch group of musicians for a one-off rehearsal day and informal concert of Shostakovich’s tenth symphony, no-one having any idea that this would develop into an on-going project as the London Shostakovich Orchestra. He has since conducted the ‘other’ LSO in all their performances of the 15 Shostakovich symphonies through to 2014. Christopher also has wide experience of the Choral repertoire. In 1990 he set up the UCL Chamber Choir which, following its debut performance of Bernstein’s Chichester Psalms, was invited to perform at Westminster Cathedral in the presence of the Princess Royal. Under Christopher’s direction the choir went on to perform the Mozart Requiem in Vienna, and performed the world premiere of ‘April Rise’ by the jazz composer Ray D’Inverno. 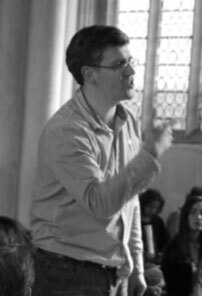 Christopher has also conducted the Bloomsbury Chamber Choir, with whom he has performed in London, Oxford and Southampton. 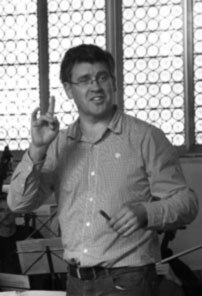 He returned to choral conducting with the formation of the London Shostakovich Choir for the 2n and 3rd symphonies in 2011 and 2012. 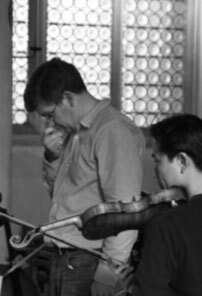 Christopher studied conducting under the late Alan Hazeldine at the Guildhall School of Music. He made his conducting debut with the Salford Symphony Orchestra in October 2013.